To warm tortillas, stack them and wrap in foil. Heat in a 350 degree oven for 10 minutes. For marinade, in a small bowl combine thawed orange or grapefruit juice concentrate, finely chopped jalapeno pepper, black pepper, and paprika. Reserve 2 tablespoons of the mixture for salsa. Add the water to remaining mixture. Score steak by making shallow cuts at 1 inch intervals diagonally across steak in a diamond pattern. Repeat on second side. Place in a plastic bag set in a shallow dish. Pour marinade over steak; close bag. Marinate in the refrigerator for 2 to 24 hours; turn bag occasionally. Remove meat from bag. Discard marinade. Place meat on the grill rack of an uncovered grill. Grill directly over medium coals, turning once, allowing 12 to 14 minutes for medium-rare. 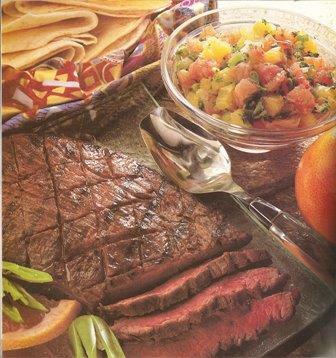 To broil: Place steak on the unheated rack of a broiler pan. Broil 3 inches from heat for 6 minutes. Turn and broil 7 to 8 minutes more for medium-rare. Serve as above. In a large mixing bowl stir together flour, sugar, baking powder, orange peel, baking soda, and salt. 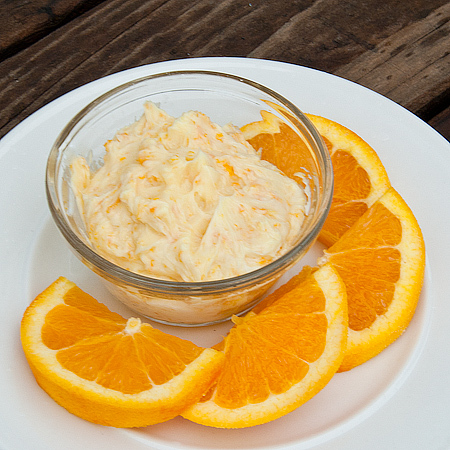 In another mixing bowl stir together eggs, 1/2 cup of the thawed orange juice concentrate, the oil, and 1 Â½ cups water. Add to flour mixture. Stir by hand until combined. Fold in dates and nuts. Divide mixture evenly between two greased 8x4x1 inch loaf pans. Bake in a 350 degree oven for 50 to 55 minutes or until a toothpick inserted near the centers comes out clean. Cool in pans for 10 minutes; remove from pans. 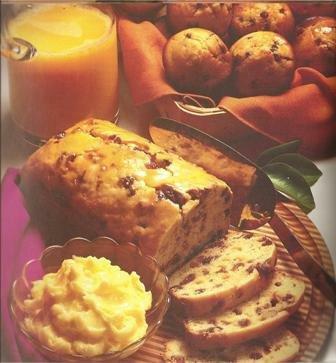 Generously brush tops and sides of loaves with remaining orange juice concentrate. Cool thoroughly on wire racks. Wrap and store overnight before slicing. Makes 2 loaves. This salad makes a stylish lunch dish or a light supper. For salsa, in a nonmetallic bowl stir together the 2 tablespoons juice concentrate mixture, the onions, parsley, lime juice, and salt. Add chopped oranges and grapefruit; stir gently. Cover and chill at least 30 minutes to blend flavors. Offer this enticing beverage with appetizers or when relaxing after a busy day. 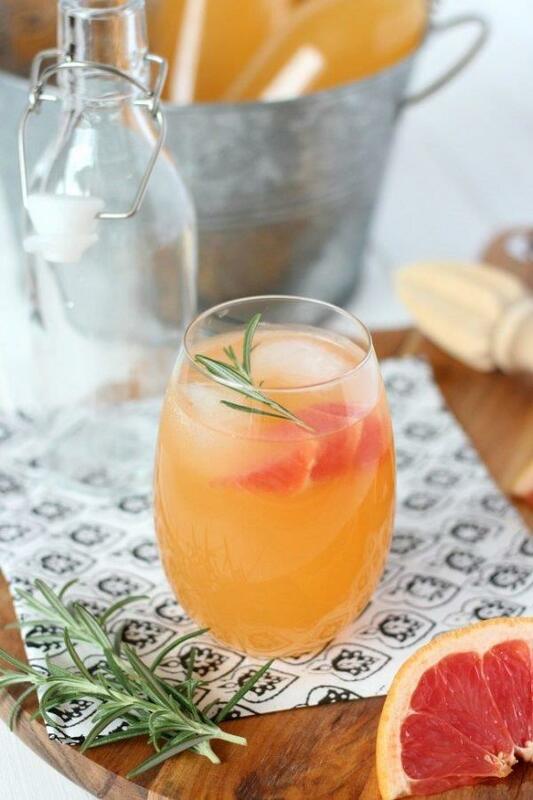 In a pitcher or serving bowl stir together grapefruit juice and wine. Add ice cubes. Slowly add the carbonated water. Serve in wine glasses or punch cups. 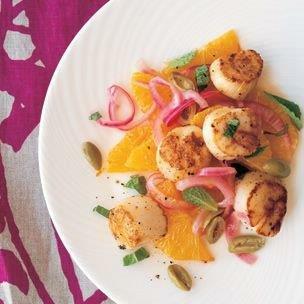 If desired, garnish with grapefruit wedges. Serve at once. Makes 4 (7ounce) servings. The few minutes you spend whipping up this top notch topping will be well worth the effort. In a small mixing bowl beat butter with an electric mixer on medium speed for 30 seconds. Then, beat in the powdered sugar. Gradually beat in the thawed orange juice concentrate. Serve at once or cover and chill to store.